ATG has developed its capabilities over the years to provide highly integrated engineering, management, procurement, and manufacturing for the infrastructure, process equipment, and marine sectors. The management of projects is critical to cost schedule and quality; the support systems available at ATG are geared for timely execution of projects and to achieve the desired objectives of quality and cost. Our project management system for budgeting, cost controlling, reporting, project schedules, plans, material management resource allocation, and supplier evaluation fulfills the Client’s demand in an economic and efficient manner, which enables ATG to maintain its delivery commitments. ATG’s management team members are certified Project Management Professionals (PMP) who ensure projects are closely monitored through every phase of the process. In an industry where performance is directly measured by project costs and the meeting of delivery schedules, ATG has established a recognized track record in completing projects on time and within budget. Throughout all phases of a project, from Planning to Erection, ATG's Project Management department relies on a team of experienced engineers and certified Project Management Professionals (PMP®) in order to achieve the desired out come on every project. Upon award of a project, ATG's Management assigns both a Project Engineer and a Project Manager to handle all technical and commercial matters associated with the project from inception to completion. At the outset of the project, the Project Engineer prepares a base schedule defining all milestones and activities and identifies major subcontractors and special requirements taking into consideration the size and complexity of the project along with the scope of work. ATG's Project Management communicates the project requirements (schedule, specifications and scope) to all other concerned departments such as Purchasing, Engineering, Manufacturing, Quality Control and Finance. Throughout the execution phase, the Project Engineer proactively monitors, controls and reports the progress of the project including material procurement, engineering, manufacturing, and testing up to project handover. Prior to starting shipment of the manufactured goods either to the Client's facility or on-site, the Project Management team assigns either a Shipment Expeditor or a Site Support Coordinator to assist the Project Engineer in providing service to ATG's customers. ATG's Shipment Expeditor ensures the timely delivery of the finished goods at the point of destination by maintaining close follow-ups with the logistics team for every project. When erection is in ATG's scope of work, the Site Support Coordinator acts as a liaison between ATG Site Engineer and the Project Engineer to assist in satisfying all the requirements of both the customers and that of the erection subcontractors at the site. In addition to the Supply, Fabrication and Delivery, ATG is also able to offer Erection Services which is either carried out by ATG's personnel or subcontracted out to qualified Erectors who work under the direct management and supervision of ATG. A qualified Site Manager from ATG will manage the project whenever erection is under our responsibility. Eliminates time and efforts in solving disputes and claims raised by Erector due to delivery issues and mismatches, if any. Saves Client’s coordination between supplier and erector. Delivery can be adjusted to suit site conditions considering most revisions can be easily handled by coordination between ATG's engineering department and its erection crew at site. ATG's management team members are certified Project Management Professionals (PMP) who ensure projects are closely monitored through every phase of the process. In an industry where performance is directly measured by project costs and the meeting of delivery schedules, ATG has established a recognized track record in completing projects on time and within budget. The Estimating Department leads and manages the estimating and tendering process for the procurement of work for ATG. Intimate knowledge of our client’s requirements intertwined with our in-house management software which monitors the various stages of contract preparations internally, forms the basis of our approach to Contract Management. Reviewing the customer’s requirements and preparing the quotations based on detailed estimates. clarifications and additional information required during estimation. Coordinating internally with purchasing department for the updated prices of raw materials and other subcontracted items. With this, ATG is able to produce, agree and execute bespoke tailor made contracts to suite our client’s needs no matter how large or small the project may be. During the bidding stage, ATG's Engineers prepare the estimations, design calculations, design drawings and material take-offs while also using the latest Auto Cad design packages to produce the optimum design which can ultimately save the customer valuable time and money. ATG's Material Planning Team operates under the umbrella of Supply Chain Management. Material Planning stage starts after the project is awarded to ATG through the Material Planning and Control Department. The department is responsible for the management and planning of the supply chain process with regards to raw material, and fasteners and other special buyouts and is processed through the Material Planning and Control Department. It is also liable for monitoring material orders of each projects closely through weekly tracking report until the materials are completely received at shop. This powerful "Material Tracking Report" is used for planning the fabrication of all projects, and to update customers about the status of their project as well. Close involvement with the Project Management in forecasting the monthly production, leading to the proper planning of sourcing the material. Reduced material costs with optimized nesting, efficient material planning, and remnant tracking. Automated and integrated purchasing and stock control saves time and effort. Satisfies ISO, and client requirements with automated material traceability by purchase order, heat cert numbers, and more. Our Engineering Department includes a team of professional engineers and detailers with engineering expertise in all aspects of steel fabrication as well as process equipment. 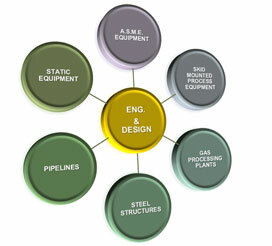 We are committed to providing efficient cost management from concept design to completion. With our in-house capabilities and collaboration with our engineering partners, ATG delivers a complete range of engineering services spanning from front-end to detailed engineering. Our engineering team provides competitive yet creative solutions and technical skills to meet the most rigorous of standards. The scope of work involves coordinating all aspects of engineering from system analysis, scheduling and budgeting, design reviews to commissioning and testing. Whether it is for heavy structure fabrication or for the manufacture of sophisticated process equipment, the Engineering and Design arm of ATG forms the backbone of the company’s success with the capability to conduct front-end, conceptual, and detailed engineering design for both the heavy-structure and process equipment divisions. The Engineering services combine the excellence of technology with sound Engineering skills to provide bespoke, value-added, and cost-effective solutions to clients. The department is staffed by a team of professional engineers and detailers with engineering expertise in all aspects of structural steel fabrication and erection. Utilizing the latest version of powerful software tools, the seasoned team produces detailed shop drawings for fabrication and installation while working in close coordination with the project architects and engineers in the strive to reduce inaccuracies and eliminate redundancies. ATG's affiliate, an ISO 9001-2008 Certified multi-discipline integrated design engineering consultancy firm in Pakistan with more than 30 years of experience in the process industry sectors. ATG's affiliates constitute an integrated design engineering and consultancy group with capabilities in process designs, mechanical engineering, electrical/instrumentation and other engineering disciplines. ATG delivers a complete range of engineering services spanning from front-end to detailed engineering. Our Engineering Department along with its affiliates includes a team of professional engineers and detailers with engineering expertise in all aspects of steel fabrication as well as process equipment. ATG ensures the seamless flow of work involved in the manufacturing of petro-chemical and process equipment with its integrated semi-automated facility. The process starts with cutting the steel plate to the required shell and dish-end dimensions on the CNC plasma/oxy machines, followed by precision roll forming in the CNC controlled roll-forming machines. This is followed by high-deposition welding under the automatic SAW welding booms along with surface preparation and finishing via the blasting and surface preparation facilities. Automated fabrication of beams linked to our in-house steel blasting and paint line allow for short lead times and the delivery of high quality heavy structures for these industries. Our close proximity to major regional refineries and plants not only facilitates quick delivery but also results in a great saving on transportation costs to both the end user and our EPC clients. All aspects of our business from purchasing to shipment are monitored and controlled through our in-house ERP software system. Our experienced Production Planning team ensures the customer requirements and Project schedule are met. We have a designated area for material preparation and have invested in reliable equipment and technologies to ensure quality and accuracy of beams, angles and plates preparation. Highly qualified fitters and welders certified to AWS and ASME standards are prudently employed for all our work. With experienced Foremen, Engineers and Supervisors overseeing all production activities. We have a large selection of welding machines and regularly utilize TIG, FCW, MCW, SMA, SAW and pulsed MIG processes. We have a library of welding procedures and qualifications for all the aforementioned processes in a wide variety of metals and alloys. Both individual and combination of these processes are utilized throughout the business on a daily basis. With dedicated blasting and painting areas of 250 m2 each having the latest equipment in order to meet the desired requirements while maintaining the highest cleanliness quality for all profiles he resources and to reduce costs. ATG ensures the seamless flow of work involved in the manufacturing of petro-chemical and process equipment with its integrated semi-automated facility. ATG believes that ensuring quality in design and manufacturing is the foundation of achieving success. In addition to meeting industry regulations and standards, ATG also complies with contractual and statutory requirements. With our extensive experience, we ensure that quality is the key that secures your product’s compliance to specifications. The ATG Quality Management System complements our business and provides the most logical direction to a quality solution. 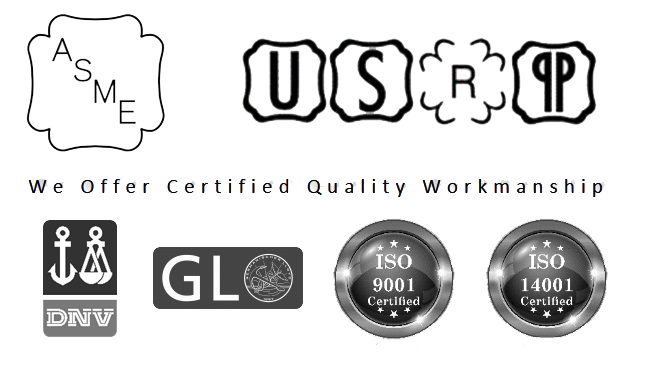 ATG is a fully certified ISO: 9001 company and works strictly in accordance to these guidelines. The QMS assures that all products comply fully with the ASME, DNV, and GL regulations. All of ATG's equipment and instruments that are used in production are certified and controlled by qualified inspectors. Inspection is conducted on incoming material and at various hold points during the manufacturing process with the final inspection carried out as per ASME, DNV and ISO requirements. Quality assurance is the key to any project, from its definition to its engineering and on-site installation. The products at ATG are constructed in accordance to national and international standards, manufacturing codes and company requirements. ATG values the importance of on-time delivery of projects to meet its customer planning commitments. Ensuring health and safety of our personnel and those associated with our activities, together with mitigating efforts to minimize adverse impact on environment, is of highest priority for ATG. ATG ensures compliance through audits carried out at regular intervals and with staff training to promote awareness of health and safety. Mandatory risk assessment and safety analysis are conducted at every work site in order to identify risks and implement control measures before work commences. ATG’s commitment to HSE and sustainable development is demonstrated through endorsements from our clients. Our people are our most important asset. Protection of their health and safety is of vital importance to us. We comply with all applicable laws and relevant industry standards of practice concerning protection of health and safety of our employees in the work place and other persons affected by our business activities. Our responsibility to the environment goes beyond regulatory compliance; it’s an integral part of our corporate citizenship. We are an important constituent of the many communities where we work and our goal is to design and to deliver projects that benefit these communities while protecting their natural resources. ATG strongly believes in the need to maintain and improve the quality of the environment. The company therefore strives to ensure that its operations comply with all applicable laws and standards, have no adverse impact on the environment, and where possible make a positive contribution to improving the quality of the environment. Our responsibility to the environment goes beyond regulatory compliance; it’s an integral part of our corporate citizenship. We are an important constituent of the many communities where we work and our goal is to design and to deliver projects that benefit these communities while protecting their natural resources. Health and Safety is one of the core values of ATG and we are committed to achieve zero injury performance. A sound Health and Safety culture at ATG ensures that all work processes are safe for our employees, partners, neighbors and customers.